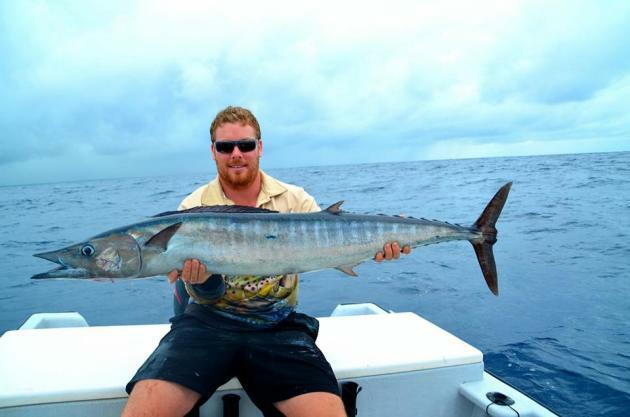 Christmas Island, part of the nation of Kiribati, is a sport fishing paradise with endless shallow flats and surprisingly good offshore species on offer. CLINTON BUSH reports. TWELVE months ago I was planning a GT popping trip up the East Coast of Australia. I had bought a 6.6m boat the year before and was keen to get stuck in to some big GTs after the south coast marlin season had come to an end. My plan was to tow the boat up north like a bull at a gate, cram in two weeks of fishing the outer reefs, then flog it back home to Victoria again. As reliable as a lot of friends are, no one could commit so I turned my attention instead to a solo overseas fishing trip. Kiribati, located between Fiji and Hawaii, truly is any fisherman’s dream holiday. The island is far from a tourist trap with only a handful of fishing lodges with the only other activity on the island being bird watching. This really isn’t a place to take the family for a week’s holiday, unless they are also as mad about fishing as you are! I flew in on the weekly flight from Nadi, Fiji, landing at around 6am. Off the plane and though immigration, which was no more than a hut, I was met by local legend and fishing guide Moana who drove me and a couple of other anglers to our accommodation at Ikari Lodge. Everyone in the van was buzzing and I had already forgot about the $250 I had to pay in excess baggage to carry nine rods and reels, and boxes of tackle, poppers, jigs, skirts and everything else you need for two weeks of blue water action. Once unpacked we hit the water onboard a 6-metre Fijian made centre console flats boat powered by a 140 Suzuki. There was just my guide Ray, a local boat driver, and myself on board. It was a perfect set up. We hit the blue water and it was like glass as we motored up the coast towards some of Ray’s favorite GT grounds. Only 10 minutes out of port we came across a school of juvenile yellowfin tuna that were madly busting up the surface. We trolled a couple of skirts through them and picked up two small fish for the cooler before punching on towards the GTs. Another 30 minutes later and we pulled up within meters of the breakers and I was told by Ray to cast as far as I could right into the guts of them. I had brought a new 24-37kg popper rod specifically for the trip. Before long I had some monster GTs follow and smack the popper but I couldn’t get a hook up to save myself. We tried different poppers and some different spots but it just wasn’t our afternoon. 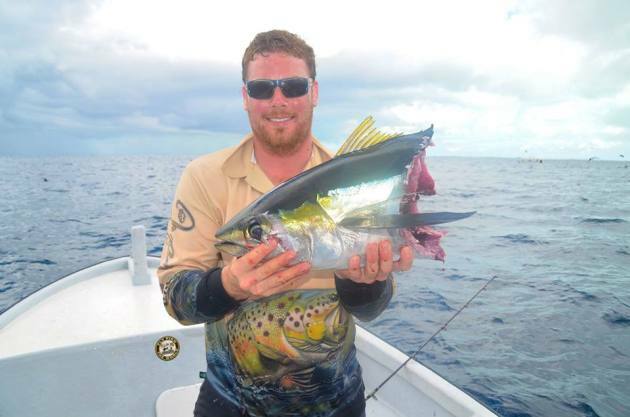 My first attempt at Kiribati GT popping was a bit disappointing, but the next two weeks of fishing would be the best I had ever experienced, catching and releasing dozens of GT and as well as getting stuck into tuna, wahoo, bonefish, sharks, amberjack, coronation trout, red bass and green jobfish! On my second day on the water I threw my popper into some 2-metre swell and blooped it back towards the boat, making as big a splash as I could. While trying to balance myself against the constant swell, I saw the shadow of a GT rise from under the reef and inhale the plug within 3 pops. On 80lb braid I was pulled up against the gunwale with locked drag on the old V System. It really is unbelievable how hard these fish can pull, and in only three metres of water it’s a real tug of water to get them in the boat before they bust your braid and take off with your $40 lure. Within 5 minutes I had a 27kg GT in my hands and was completely stoked! We landed half a dozen GT that day and narrowly missed out on hooking a fish that must have been close to 40kg from the look of it as it swam past the boat. Over the trip the average GT size was about 10kg but I landed plenty over 15kg and a handful over 25kg. There were definitely bigger ones out there, proven by the photos around the lodge of GT that were over 50kg, most landed by super keen Japanese fishos who love there popping more than anyone! For the majority of the trip I stuck with large 200-250mm cup face poppers but occasionally swapped to stick baits, which were also successful, especially on the smaller fish. The new Halco Skim Stick was also a favorite on the school-sized fish in the lagoon. In the dead flat water of the sheltered lagoon, the lure skimmed beautifully and took care of more than a few GT who were patrolling the drop offs. Through the two weeks the technique stayed the same, pull up in water 2-5 meters deep, cast, pop, repeat. During the second week we came across a school of 10kg GT on a shallow reef. I was hooking a fish every second cast and after a dozen fish caught and released I barely had enough energy to cast back into the school! My main stick was an 8ft Gladiator Kor which cast like a demon! With a good wind up it was easy enough to throw a 300gm popper 50 meters towards the breakers, but it did get heavy after a few hours. When I was worn out I’d switch down to a 7ft Daiwa Opus Bull, which was perfect for casting lighter poppers like Halco Roosta poppers. Even switching down to 50lb braid on the Opus Bull, it was no problem landing 15-20kg GT in 2-3 metres of water. For popping I used 130lb black magic leader with an FG knot of 10 wraps. Some people don’t think 10 is enough but it worked for me and never broke. I took a bucket full of jigs with me but only really spent a couple of days using them. 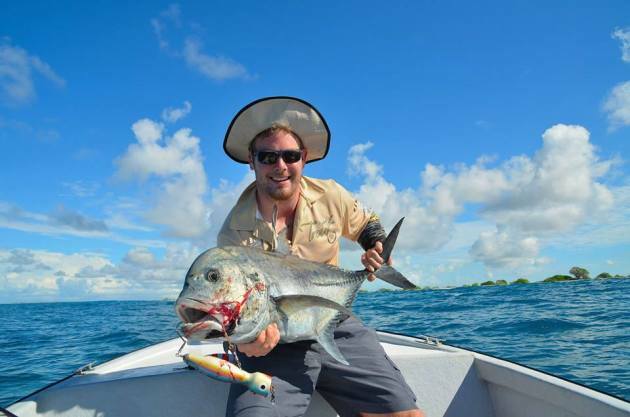 Jigging in Kiribati really is like a lucky dip compared to GT popping. When you pop with huge plugs in shallow water you know you’ll get a GT eventually. When you drop a 200gm jig down you could literally hook half a dozen species! The depth of water in Kiribati also changes dramatically. 200 meters offshore could be 50 meters deep, but go another 200 meters further and it could be 500 meters deep. In one day of jigging we landed amberjacks, GTs, green jobfish, coronation trout, red bass and some decent sized sharks. Once you found the right depth of water to jig in (the boat didn’t have a sounder) it was like shooting fish in a barrel. Every second drop there was something hanging onto the jig! Further offshore I also landed a handful of yellowfin tuna on 300gm jigs. The tuna would bust up the surface then follow the bait down deep. When they went deep, dropping a heavy jig down 100m and screaming it back towards the boat was successful, even if it was hard work! I took two Jig rods for the trip, both Berkley Blast 15-37kg sticks with 50-80lb Power Pro on Daiwa Opus Bull reels. When I wasn’t looking for GTs I wanted to get stuck into big yellowfin on spin gear. I had had a tough time landing a yellowfin on the east coast and wanted to make up for it now! The plan was simple. Head out wide and look for birds and follow them. Usually within an hour of searching we were amongst a school of 'fin smashing bait balls while the birds hit the bait from the air. The best technique was casting 100-200gm chrome blades or sinking stick baits right into the school of fish and birds before retrieving at high speed. Typical of tuna, they swung from being not interested to completely smashing it depending on the day or even the hour. My rod of choice was my old Daiwa Opus Bull PE 2-5 with 50lb braid on another Okuma V system. Once hooked up you had to try and get your fish in the boat as soon as you could before it was chomped by a big toothy shark. For every three tuna I got in the boat, I’d lose one to the sharks, often only getting the head back. On the 6th day I hooked into an estimated 20kg yellowfin on a stick bait and it dived down deep ripping my 50lb Platypus braid off like I was using bream gear. Within 30 seconds the screaming run had stopped and was replaced by a slow consistent pull deeper and deeper. My fish had been murdered and the lure was now stuck in a shark somewhere. For an hour we chased and tried to raise the shark to get a good look at it. I had just over 300m of 50lb braid and at one point I got down to the last few meters before the shark headed closer to the surface by its own accord. I got about 200m back before he dived down again. No matter what I did I couldn’t move or turn it. The shark was just swimming wherever it wanted and with no harness my arms and back were copping everything. The lure must have been stuck in its fin or tail because after an hour at near max drag I hadn’t turned him at all towards the boat. During the drama the tuna were still busting close by and within 20m of the boat a Marlin which would have been pushing 600lbs launched its whole body out of the water while the tuna ran for cover. Eventually under full drag the braid popped and my favorite stick bait was gone. I don’t do a great deal of shark fishing these days, but a few years ago I used to love chasing big makos and whalers and I have never felt the power of a shark like that. Ray’s best guess was that it was a tiger shark over 300kg. We caught over a dozen yellowfin that day with the biggest at around the 30kg mark. We took two back to the lodge and released the rest to be caught another day. Just like at home 6-8 inch skirts worked great too when having a break from casting. Black and purple skirts also took care of a few GTs and bluefin trevally when trolled in shallow water, which was a surprise. Now I can’t fly fish to save myself, in fact before this trip I had only ever practiced casting on grass. I took a handful of flies and borrowed an 8wt G.Loomis rod and Sage reel from by best mate, Joel. The reel was loaded with cool water fly line and I had been warned that the cool water line wouldn’t work in the +20 degree Kiribati sea water. I was keen to try anyway. Thankfully the line didn’t seem to be affected by the water and I was pretty happy with my casting. 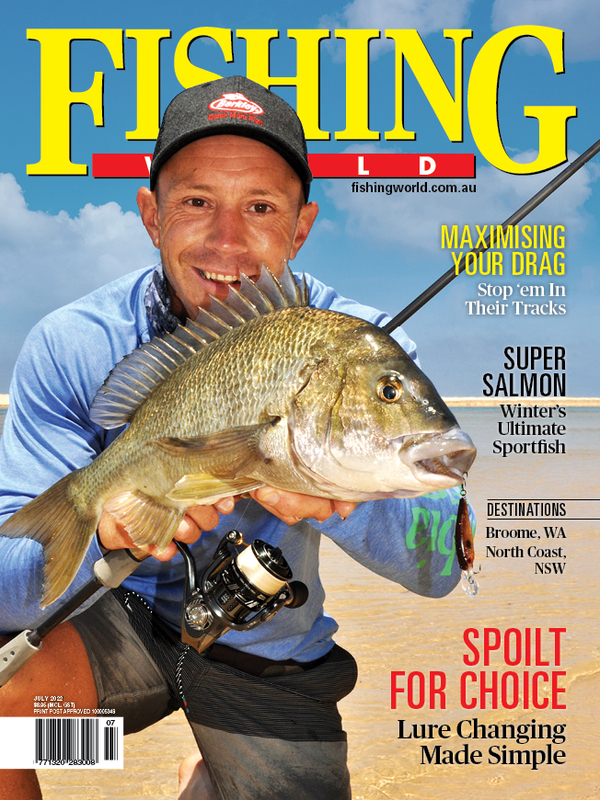 I also picked up a few casting tips from Tasmanian fly fisho Shayne Murphy who was on the Island for three weeks and had been consistently smashing fish every day. I hit the flats with another guide Tim who was an expert at spotting bonefish, triggerfish and GT on the sand flats. Tim would walk next to me and tell me where to cast and how to retrieve the fly each time. The first couple of hours we walked across a coral grave yard casting small popper flies at baby GT who were stalking along the drop offs. Tim made me cast repeatedly 10 metres (about my limit) into the deep water and gently pop the fly back to the coral. It didn’t take long and I had a baby GT on the end of the rod. It was my first fish ever on fly and I didn’t care how small it was. By the end of the day I’d caught half a dozen bonefish, smaller GT and some red snapper. The size of my bonefish were nothing to get excited about, but a young Texan (and self confessed Trump fan boy) Ronny sniffed out an 8 pounder in 30cm of water just in front of me. He had had a hard couple of days trying to find a good bonefish and the whole lodge was happy for him. Satisfied with my one days fly effort I put the rod away and wanted to get back to catching real GTs on poppers! 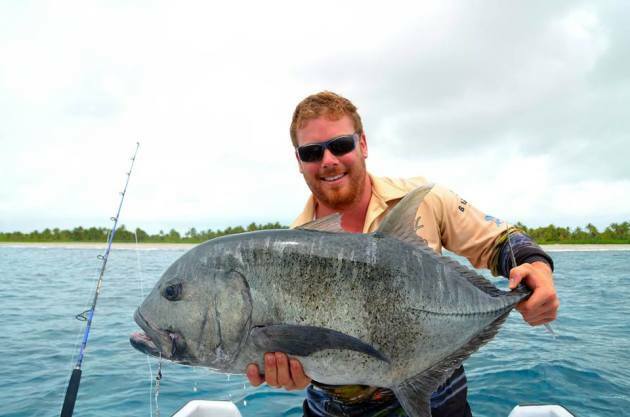 Kiribati fishing really is all its cracked up to be when it comes to knocking over big fish in big numbers. In the two weeks I was there the biggest GT caught was my own at 27kg and the biggest yellowfin was 94kg taken by another angler staying at the same lodge. It’s very positive to see that both GT and bonefish are protected species on the island so only catch and release are permitted for both. All other fish that are kept are cooked at the lodge or taken home by the guide, the boatman or other locals. Free pair of Mako sunnies with Fisho subsciption!